Set in the small Mexican village of Santa Cecilia, Coco follows twelve-year-old Miguel Rivera (voiced by Anthony Gonzalez), the youngest of a family of shoemakers. Despite generations of his family forbidding music, starting with his great-great-grandmother Mamá Imelda, Miguel wants nothing more than to play guitar like his idol, the late. great singer-songwriter Ernesto de la Cruz (voiced by Benjamin Bratt). On Día de los Muertos, Miguel breaks into de la Cruz’s mausoleum, planning to use the singer’s legendary guitar and go against his family’s wishes to play in the town square’s music competition. But as he strums the guitar, Miguel is taken from the mortal plane and transported to world of his deceased, skeletal ancestors, who have the one day to visit their living family members. Miguel is taken to the beautiful, sprawling city of the Land of the Dead, where Miguel embarks on his quest to return to the living world, assisted by skeleton trickster Hector (voiced by Gael García Bernal), and discovering the secrets about his family that have been buried for generations. The visuals of the film are completely stunning, from the infinite stacked cities of the Land of the Dead to the neon-colored alebrije (mythological spirit animals) to the enchanted marigold petals that lead the dead to the Land of the Living. Pixar animators are once again in their world-building element, creating expansive universes with details sprinkled in every corner. The music also plays a large part of the film, making it a musical of sorts, a first for a Pixar film. Frozen writers Kristen Anderson-Lopez & Robert Lopez return with the films signature song, “Remember Me,” which reoccurs several times during the film, changing the context of the lyrics each time it is performed, each by a different character. True to Pixar fashion, the film is filled with many emotional moments. Tying itself to the holiday of Día de los Muertos and its inherent themes of family and remembering those who have passed away, Miguel is forced to make many important decisions regarding what is most important to him, his family or his music. His adventuring companion Hector also faces harsh stakes throughout the film, as he tries to beat the clock and visit the Land of the Living before he is forgotten completely in the living world, a fate comparable to death for the dead. 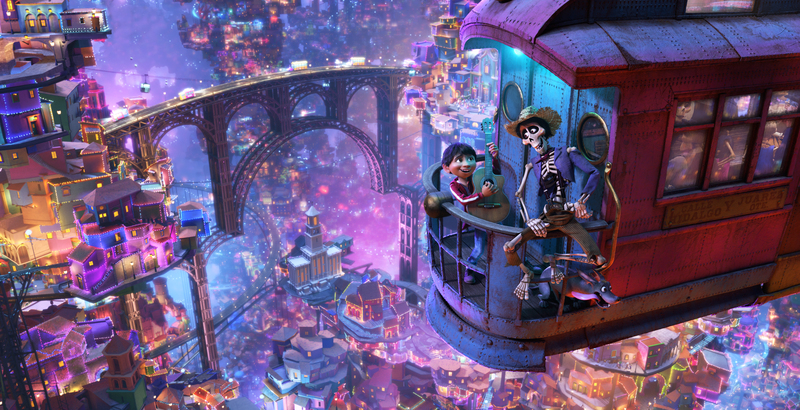 With a catalog full of successful and wholly entertaining films, Pixar’s Coco almost certainly stands among the best, creating a beautiful, majestic, musical story that surely will not be forgotten soon. I surely won’t, since seeing the film, it has quickly become my favorite Pixar film of all-time! You can learn about the making of Coco from the recent interviews I attended with the creators and cast of the film here. Pixar’s Coco is now in theaters, you can get your tickets here! Minnie: Bow Be Mine on DVD!